‘Stay in your bed’ sticker chart progress + print your own! I thought I would do a quick update on how the sticker chart is working for us so far. Brooklyn is 3 years old and this is the first time we’ve used a sticker chart for him. 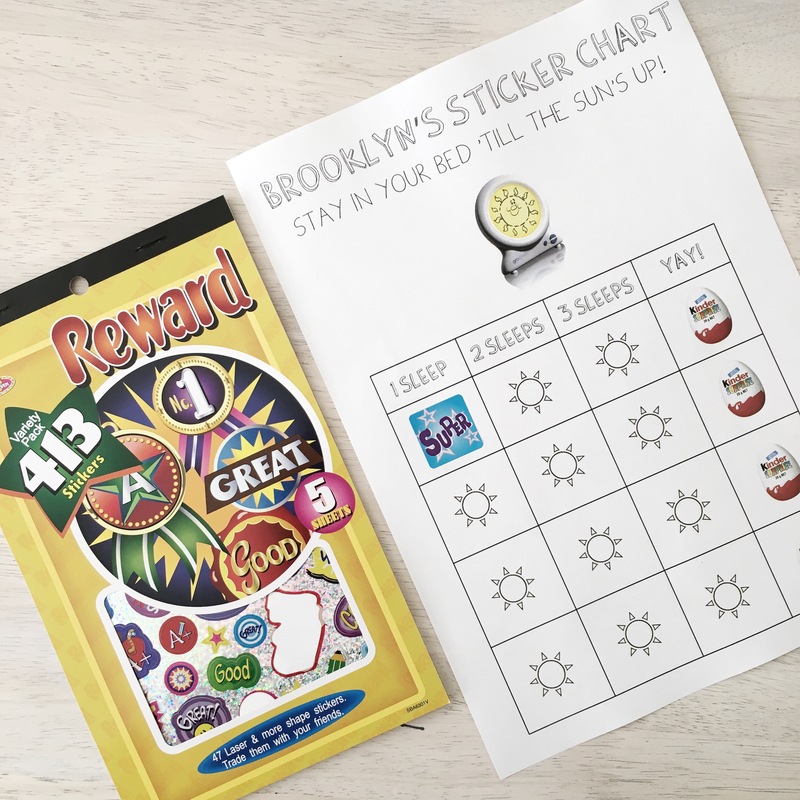 Unsure of how it would go, and whether he would even care – I decided not to have too many stickers before he got a reward. I thought 3 was a good amount for him to not loose interest in the whole idea, for his first chart anyway. The reason we started it was because Brooklyn was coming into our bed in the night. At first it was at about 5am. That was okay, I didn’t mind morning snuggles as he would go back to sleep with us. Then it was 3am, then 1am… then before I even went to bed! Heeeeell NO, Brooklyn! I love you, but I love you more when I don’t have your fluffy head of hair smooshed up to my face all night 😉 Cue sticker chart! 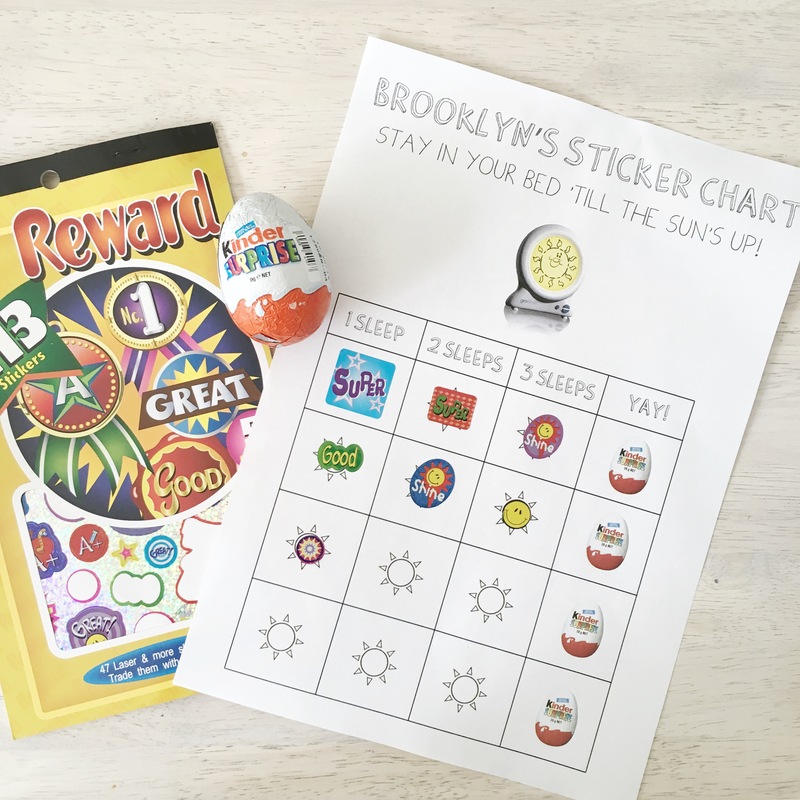 Paired with his Gro Clock (we’d kind of fallen off the wagon with this), 3 nights in his own bed until the sun came up and he was rewarded with a Kinder Surprise (or a ‘surprise egg’ for those that watch the damn you-tube videos on them *cough* Brooklyn *cough*). He goes to bed at 6pm so the sun is set to come up at 6am. Night 1: Woke up twice before 12am, was marched back to bed by Daddy. Woke at 4.30am, marched back to bed by Mummy. Woke at 5.30am and woke up Marlo. Cue Hulk mad Mummy. Grrrrrr! Night one – FAIL! No sticker. He was horrified. I’m talking screaming the house down because there would be no sticker, he even asked to go BACK to bed… heck no buddy, you’ve woken the whole house up – you can stay up too! Night 2: Woke at 4.30am to tell me Marlo was awake and needed a Kai. Fair call, thanks dude – I hadn’t even heard the monitor yet haha. Happily went back to sleep. Woke at 5.30am to tell me he’d done a poo. WTF. Who gets up that early to poo?! Changed his nappy, put him back into bed. He didn’t come out until the sun came up at 6am. Yay! Sticker! Night 3: Woke up at 6.10am. STICKER! Night 4, 5, 6, 7: Occasionally gets up to tell me Marlo’s awake when I’m too tired to notice, but happily goes back to sleep. Hasn’t woken until after 6am each morning! Stickers all round! So far, so good! It’s nice to have our bed back! Click HERE to download the Gro Clock sticker chart (like Brooklyn’s, but without a name) or click HERE to download one where there is space to write a specific time on the chart.